The SA SM swing arm system is designed for use with a control panel, OICP, or with a control enclosure, OICE. 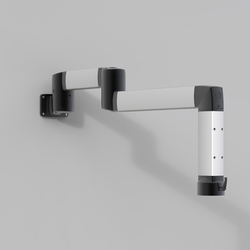 With closed profiles, the loading capacity of the swing arm system is up to a maximum of 1250 N. The system is complemented with an extensive range of different elbows and couplings, which allows for the creation of a fully customized solution with standard products. The SA SM system has been tested to prove it withstands vibrations. The maximum weight which a SM swing arm can support depends on the length of the arm and the systems structure. See diagram in mounting instruction. Medium swing arm system with a wide range of accessories. Ideal for use with a control panel, OICP, or with a control enclosure, OICE. A standard solution available off the shelf, allowing for the design of customized solutions. This fully tested solution, with a loading capacity of 1250 N, can be delivered quickly. It enables the operator to position the control panel, or enclosure, in the exact required position.